Jodhpur is known for its hot climate and its location of being right at the edge of the Thar Desert, and with the number of amazing things to see and do in this city, you just can’t miss the prominence of Mehrangarh Fort. This vast fort is one of the largest in Rajasthan, perched upon a hill at 400ft, spread across 5kms in the heart of the city. If you wish to explore the deep history and culture of Jodhpur, Mehrangarh Fort will be the ideal spot for the same, as it is a rather famous tourist destination in Rajasthan. 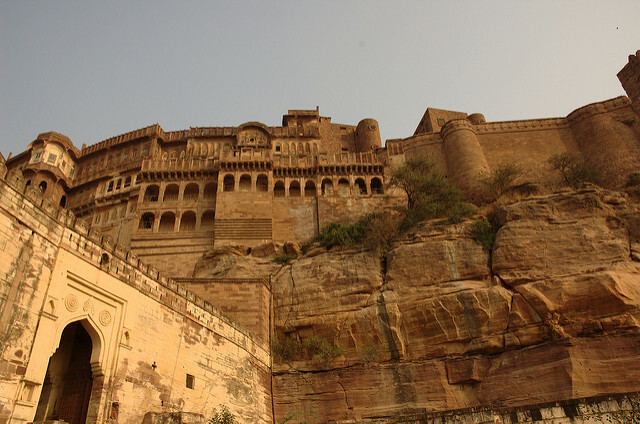 Mehrangarh Fort was built in 1438 by Rao Jodha, after whom the city of Jodhpur is named. The walls of the fort have a height of 118 feet and a width of 69 feet that protect the massive area of it. There are various palaces located inside the walls of the fortress, which have their separate, distinct identities with intricate Rajasthani carvings and design. Two ancient temples are also situated in the fort, which, along with the rest of the building, bear the work of over 500 centuries of different artists. The museum inside the fort contains relics and ancient artefacts that come from not only the royal families of Rajasthan, but also of the Mughal dynasty culture. Musicians play traditional folk songs at the entrance of the fort, giving it a charming allure for tourists. The name Mehrangarh is derived from a combination of two Sanskrit words: ‘Mihir’ meaning the Sun god, and ‘Garh’ meaning fort. The families that lived in Mehrangarh fort were believed to have their origins in the Sun God from Hindu mythology. Legend has it that a hermit called Cheeria Nathji used to reside on the hill when Rao Jodha had the hermit move so the fort could be built. Angered by having his home taken away, Cheeria Nathji cursed Rao’s family saying that his fort would always suffer from scarcity of water. Rao Jodha then had a separate home built for the hermit in the fort premises, but until today the area faces draught every 3 to 4 years. The construction of the fort was started by Rao Jodha in 1438, but most of the other developments within the grounds of the fort were done during the time of Jaswant Singh in 1638 to 1678. The popular 2012 film from the Batman series ‘The Dark Knight Rises’ had a significant scene shot at Mehrangarh Fort. The Mehrangarh Fort Museum has a vast collection of paintings, costumes, arms, and carved rooms from the time when the royal family lived there. The temples located inside the premises of the fort are known as the Chamunda Mataji temple and Nagnechiji temple, which have fascinating tales behind their idols. The ziplining activity known as Flying Fox is quite an enjoyable experience at Mehrangarh Fort, and many tourists make it a point to indulge in it while at the location. The palaces at Mehrangarh Fort are called Sheesh Mahal (the mirror hall), Moti Mahal (glass-painted windows of pearl colours where the Maharajas held their courtroom), Phool Mahal (the extravagant hall of leisure activities of the royal family), and Zenana Deodi (women’s quarters made of sandstone). Performances of people wearing traditional Rajasthani costumes are usually on going at Mehrangarh Fort, who represent authentic culture of Rajasthan through playing instruments and singing folk songs. The atmosphere of the fort is relaxing if you were to explore all the nooks and crannies. That way you can also see the Chokelao Gardens, situated in the fort premises. More than 200 eagles gather every day from 3.30pm to 4pm, when a young boy employed by the fort management feeds the eagles from on top of the tower across from the Chokelao Gardens, which is quite the interesting sight to see. Wear comfortable shoes while hiking up the hill, or take the stairs leading up to the fort from the central market. Hats are recommended during day time because the heat gets almost unbearable in Jodhpur. Explore the fort as best you can to get a stunning view of the city below. On Jodhpur foundation day, the 12th of May, entry in Mehrangarh Fort is free for all visitors. Audio guide tours are available at the following prices. Jaswant Thada is a popular tourist destination that is often visited along with Mehrangarh fort, and royal memorials built in marble on a serene lakeside location. Umaid Bhavan Palace is another famous tourist spot where the Maharaja of Jodhpur still lives. Other sites near Mehrangarh Fort include Khejarla Fort, Balsamand Lake, Kailana Lake, Ranisar Padamsar, Gulab Sagar Lake, Ganesh Temple, and Pal Balaji temple. Jodhpur is a haven for history lovers and travellers who wish to explore the tradition and royal lifestyle of the Rajasthani rulers. With Mehrangarh Fort being the most popular tourist spot of the city, Jodhpur gets a lot more well-deserved attention.